You need a job. In fact, we all need a job, because the sad truth is being a human person is way easier with money. With that fact in mind, it's our humble recommendation that you make some money in the near future, and that you look in the right place when you do it. Like these 15 cities, which not only have jobs, but have jobs that pay really well. This blessed list comes via Ladders and reveals the 15 cities with the most jobs paying over $100,000 right now. 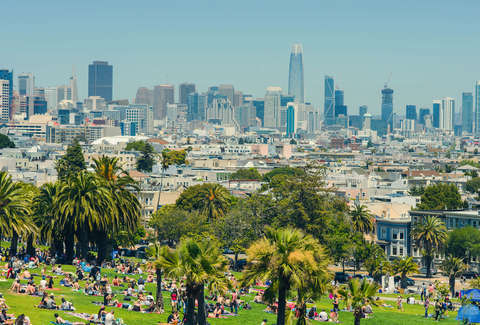 It's not guaranteed that your rent woes will be a thing of the past if you get yourself to one of these cities, but it certainly won't hurt your chances. As you can see, not all cities on this list have an equal amount of opportunities to make enough money to spontaneously purchase plane tickets. In fact, San Francisco, the top spot, has roughly six times as many jobs as the bottom, Austin. But there are fewer tech bros there, so fair trade off. If you are going to play the numbers in San Francisco, some of the job options listed by Ladders include Big Data Developer and Vice President, Sales, but considering there's over 30,000 opportunities, you should have some stuff to pick from. New York, which came in at No. 2, also topped Monster's list of the top cities to find a job right now, so it's no surprise that it came in near the top. But you'll probably have an easier time making rent in cities that aren't those top two if you don't end up with the coveted high-paying gig. If you're less picky about where the job is located and more interested in just making the money, check out this list of the top companies with jobs paying over $100,000.